To mark Einstein's seventieth birthday, Albert Einstein: Philosopher-Scientist was published under the editorship of Paul A. Schilpp, a professor of philosophy and Methodist minister. The work was essentially meant to explain the importance of Einstein's contributions to physics, and his own impressions on his life and work, contained in the "Autobiographic Notes" with which the book begins. Amongst the prestigious scientists and philosophers who worked on the publication were Niels Bohr (1885-1962), author of the article "Discussion with Einstein on Epistemological Problems in Atomic Physics", in which the Danish physicist told of the conversations he had held over the years with Einstein regarding the course being taken by atomic physics, currently immersed in a process of development and consolidation. As scientists' understanding of the constitution of atoms developed, classical physics began to prove increasingly lacking when it came to providing explanations, especially following the discovery by Ernest Rutherford (1871-1937) in 1911 of the nucleus of the atom. 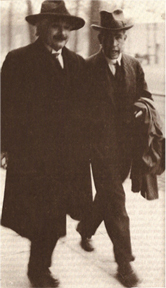 Bohr and Einstein first met in Berlin in 1920, and hit it off well, personally and scientifically. Despite their differences of opinion regarding quanta, this mutual admiration was to last the rest of their lives. Einstein was reluctant to renounce classic ideas of continuity and causality, which could not be sustained using the quantum approaches that were gaining increasing numbers of devotees. Quantum mechanics became Einstein's obsession, as he himself recognised: "I have thought a hundred times more about quantum problems than I have about relativity". For his part, Bohr took some time to accept Einstein's photon theory, but Einstein stubbornly insisted that "God doesn't play dice", predicting an eventual return to Newtonian determinism. In September 1927, a congress was held in Como to commemorate the centenary of the death of Volta, at which Bohr set out his principle of complementarity to describe the nature of both matter and radiation, according to which the wave and corpuscular models coexisted and complemented each other. The Spanish physicist Blas Cabrera was there; Einstein did not attend. In October of that year, however, he did attend the Solvay Congress where he publicly rejected the new approaches which he ironically summarised in picturesque phrases such as "ghost waves guiding the photons" to ridicule the quantum interpretation of light as something that "travels as a wave but departs and arrives as a particle".